What does the Team Recharge Delay on soldier class mods do? What does the -20% Team Recharge Delay stand for? Is it a good thing or a drawback of the mod? I guess it should be something like the Deploy Skill (that reduces the cooldown time of the scorpio turret) for all the team, but I'm not sure. It means that the shield recharge cool-off time is reduced by 20%, for the entire team. In other words, your shields will start recharging earlier after taking damage. What does “burst fire count” mean? 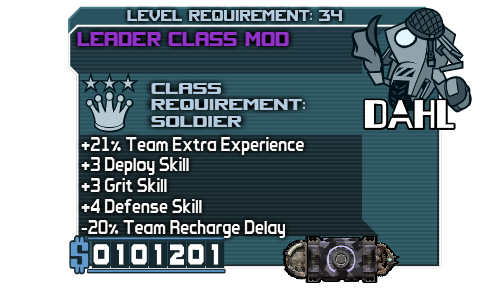 Can Borderlands class mods raise a skill past 5 points? Does Crawmerax drop better items when playing as a team? Where can I find more “Omega” equipment? In what order should I put my skill points if I want to maximize the damage that Roland's Scorpio Turret inflicts? What makes Vault Hunters so different from everyone else? What rarity does each of the loot color represent?